We’d love your help. Let us know what’s wrong with this preview of Heavenly Signs by Mel Gable. Those who have wondered about creation and if the Bible is truly from God will definitely get a clear answer to both questions by reading this book. God created the heavens for greater significance than separating the day from the night. It was created to display “Heavenly Signs.” The heavens reveal to mankind the truth about the End Times and the timing of events. It is a Those who have wondered about creation and if the Bible is truly from God will definitely get a clear answer to both questions by reading this book. God created the heavens for greater significance than separating the day from the night. It was created to display “Heavenly Signs.” The heavens reveal to mankind the truth about the End Times and the timing of events. 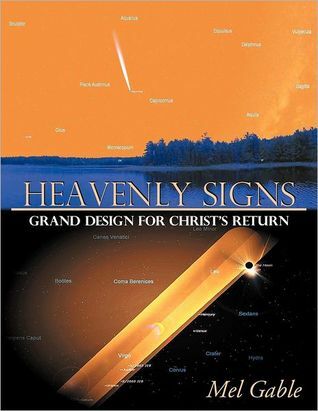 It is astonishing to find that God’s Word aligns perfectly with the heavenly signs that have been shown in this book. Signs were placed in the heavens by God Himself and the motion of heavenly bodies was determined at the time of creation by God. This, without a doubt, proves there must be an Almighty God who has had a plan for this earth, since the beginning of time. To ask other readers questions about Heavenly Signs, please sign up. What do you get when you merge the book of Revelation with astrology? You get what you start with: Revelation, in the spirit in which it was written. Few people give credence to the astrological underpinnings of Revelation, and the utter fascination its intended first-century audience held with the mysteries of the heavens. So while I knew I would disagree with Gable’s future-based interpretation of Revelation (I myself have little faith in astrology but quite a bit of faith in the historical-cri What do you get when you merge the book of Revelation with astrology? You get what you start with: Revelation, in the spirit in which it was written. Few people give credence to the astrological underpinnings of Revelation, and the utter fascination its intended first-century audience held with the mysteries of the heavens. So while I knew I would disagree with Gable’s future-based interpretation of Revelation (I myself have little faith in astrology but quite a bit of faith in the historical-critical approach to Revelation—see my own book about the topic here www.thewayithappened.com/revelation), I wondered if his work would provide an exposition that does justice to this fascinating Bible book. I wasn’t disappointed. Gable lays out a timeline of events, culminating in a future reappearance of Christ, just as the original readers of Revelation would have expected. It’s the first century all over again! Computer projections tell us there is a time coming when all the signs in the heavens align with the prophecies of Revelation and other scriptures. I won’t play the spoiler by telling you when that time will arrive; buy the book to learn when it all happens. Gable treks through each of the seven Trumpet signs of Revelation, explaining their relevance and the “heavenly sign” which will trigger them. For example, the first judgment will arrive as the planet Saturn and the moon both participate in an eclipse of the sun, turning the earth into darkness during the daytime. One of the more fascinating projections is the appearance of a light tunnel stretching from heaven down to earth, precisely at the time Gable calculates that the armies of heaven will arrive for Armageddon. Gable describes this tunnel like Jacob’s Ladder, enabling heaven’s hosts to travel down to earth for battle. Gable feels no awkwardness in drawing on pagan mythology, as he points out common associations with the stars in antiquity. Jupiter is a messianic star, being associated with the Messiah. Mercury represents the Antichrist, Mars is the god of war, Neptune is the god of water and the sea. The meaning of the constellations, too, borrow from Greek and Roman mythology. This is a very interesting book that clearly shows a lot of study on the Scriptures and research on sky maps, looking for eclipses and all type of signs described on the Bible. The author came up with his interpretation of the Scriptures and using a very interesting software ("Starry Night" by Simulation Curriculum Corp) which maps the sky on any date in the past or future, he found out some matches for his interpretation on the end of times, based on what is written on the Scriptures. Most of his This is a very interesting book that clearly shows a lot of study on the Scriptures and research on sky maps, looking for eclipses and all type of signs described on the Bible. Most of his interpretations make sense, like associating Saturn as the ruler and father figure, Neptune as the god of water and sea (and his role at the Second Trumpet), Uranus as the god of sky and heavens (and his role at the Fourth Trumpet) and so on. He has an interpretation on most of planets, constellations and even comets. Very entertaining reading, the book is full of beautiful illustrations and if not for some citation on apocrypha books, like the Book of Enoch (only accepted by the Ethiopian Orthodox Church and Eritrean Orthodox Tewahedo Church but no other Christian group) or the Book of Jubilee, it would be completely based on the accepted cannon of the majority of christian churches. But this does not diminishes his work. Most likely he would have reached the same conclusion even without those above mentioned pieces of work. Adding them just gives more "juice" to support his theory. I recommend this book to the permanent library of any person that is interested in Eschatology, as well as on knowing different interpretations or point of views on what is coming at the end of the days and when it will happen.